The bottom caddis was created for winter trout fishing on Vancouver Island streams when a favourite food source for large marauding trout are the bottom dwelling caddis larvae. These insects attach small pieces of sand and other materials to form a protective shell as they in turn scour the stream bed for food. Often, flakes of mica are picked up for their shells and consequently, a reflective sparkle is apparent when they slowly move among the bottom rocks. This is why a silver tinsel chenille is used as the primary body layer, over wrapped with dubbed green seal or other appropriate material. However, a key factor in using this fly is to fish it right off the bottom, therefore several turns of lead wire should be used as the first step in the body construction! Although the bottom caddis was devised primarily for stream fishing, I have enjoyed a day of excellent success with this fly in a Prince George area lake. One fine June day when the northern mosquitoes were in full bloom, I made the difficult trek over a very boggy trail to Wicheeda Lake, some forty kilometers east of Bear Lake. I was primarily fishing a wet line from a float tube and had experienced only marginal success with leech patterns. As I could see numerous fish feeding near the bottom in this very clear lake, I switched to the bottom caddis and was delighted when the trout cooperated with several solid strikes! Perhaps this fly may not have been designed for lake fishing but I cannot argue with the results of that day on Wicheeda Lake! Hook : 6 to 10. Body : Silver sparkle chenille. Ribbing : Thinly dubbed green seal allowing the sparkle chenille to show underneath. Hackle : Short black rooster hackle. Head : Light green wool immediately behind the black hackle. 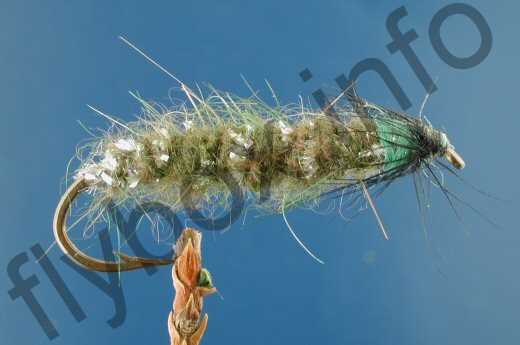 Currently there are no comments about the Bottom Caddis fly pattern from other fly fishermen yet.